Welcome to the very first Composer of the Month. This is a new regular series in which I will explore the vocal music of different composers. As part of Composer of the Month, a free pdf will be available of this month’s composer for you to use with your students. I will also post at least two posts, one with a biography of the composer, and one with a selection of typical vocal works and some notes on what makes their music famous. George Frideric Handel was born in Halle, Duchy of Magdeburg. Halle is in the east of modern Germany, but when Handel was born, it was in a country called Brandenburg-Prussia which became the Kingdom of Prussia in 1701 (Handel was 16). 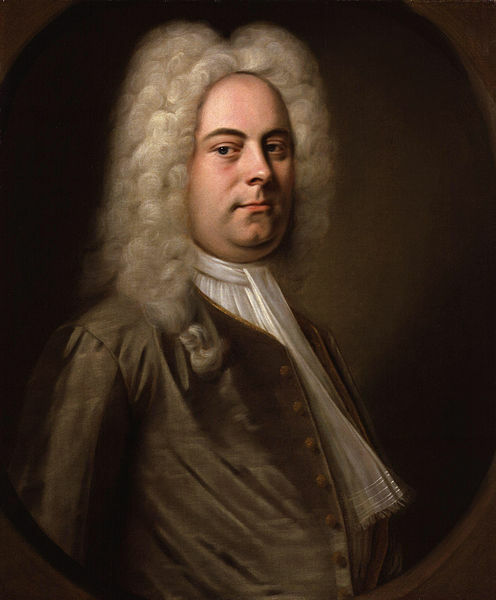 Handel loved music from an early age, but his father wanted him to become a lawyer. Young George was forbidden from studying music, so the story goes, and he practiced in secret. Then, during a visit to relatives, he surprised everyone with his ability to play. This convinced his father he should continue to have musical training, although not enough to dissuade him that the career for Handel was the law. Just as his father wished, Handel headed off to law study at the University of Halle, but this commitment didn’t last long. Within a year, Handel accepted a job as violinist and harpsichordist for the Opera in Hamburg (at the time, an independently governed imperial city in the Holy Roman Empire, and now in northern Germany). After a few years of working as a musician and composer, Handel left the Holy Roman Empire for Italy at the invitation of the powerful Medici family. Italy was the place to be in the early 18th Century for composers as it was at the cutting edge of musical fashion. Opera was booming business and Handel was soon adding his own sound to the mix. Handel also worked for the Papacy, writing sacred music for the Roman Catholic church in the form of cantatas (songs) and oratorios (choral works). In 1710, Handel returned to Germany, where he became court musician and composer for Georg, Elector of Hanover. As part of this role, he travelled to London, where only a few years later his patron would also move. In 1714, Georg of Hanover became King George I of Great Britain and Ireland. In London, Handel thrived, holding posts with the Royal Academy of Music, and the Royal Opera in Covent Garden. He also continued to work for the Hanover family, composing one of his most famous works, Zadok the Priest, for the coronation of George II. It was this royal music which includes Music for the Royal Fireworks and the Water Music which would fix Handel in the history of music as one of the most famous composers of all time. Handel continued to write operas in London, and also travelled Europe recruiting for choirs and orchestras. Later, he returned to religious music, as this seemed to be more popular among the London audiences. His most famous work, the Messiah, was first performed in 1742 and has been performed constantly ever since. When he died in 1759, Handel was one of the rare breed of artist who was recognised as great during his lifetime as well as after. He was buried with full state honours in Westminster Abbey. Three thousand mourners attended the funeral. Today, his works live on amongst the most popular works of all time. This year (2013), the Messiah placed at 22 in the Classic FM Hall of Fame (an annual public vote of favourite classical music). This entry was posted in Composer of the Month and tagged baroque era, biography, composer of the month, history of music on 4th September 2013 by .